The Al Hirschfeld Foundation is proud to announce a new exhibition, “Al Hirschfeld: A Celebration of Hollywood and Broadway” opening at the Huntsville Museum of Art on May 27th. The show features nearly 50 drawings and prints spanning Hirschfeld’s career and gather together icons from the Great White Way and the Silver Screen including John Wayne, Carol Channing, Richard Burton, Zero Mostel, Elizabeth Taylor, Katherine Hepburn, and Marlon Brando. Among the art in this new show is a lithograph of Marilyn Monroe’s famous sewer grate scene from The Seven Year Itch; Clark Gable as Rhett Butler, and a white haired Charlie Chaplin, drawn from life from a Hirschfeld interview in 1942. A sultry drawing of Sophia Loren entwined with Anthony Perkins from their 1962 film, Five Miles To Midnight also greets visitors to the exhibition. The name Al Hirschfeld has virtually been synonymous with Broadway since his first theatrical drawing was published in December 1926. But by then, he was a six-year veteran of movie studio publicity and art departments, having already worked for Goldwyn, Universal, Pathé, Selznick, Fox, First National, and Warner Brothers. This exhibition highlights his contributions to both the theater and film worlds. “Hirschfeld was the court artist for all the performing arts,” says David leopold, Archivist of the Al Hirschfeld Foundation, “but he drew more of Broadway and Hollywood than anything else…or anyone else. Hirschfeld’s depictions of Carol Channing in Hello, Dolly! and Zero Mostel in Fiddler on the Roof in the exhibition, capture two high water marks on Broadway world. 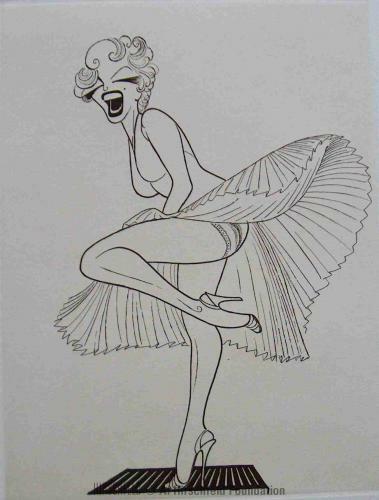 but the show also includes drawings featuring the Lunts, Jimmy Durante, Ethel Merman, and playwright Arthur Miller, “so no one will go home unhappy,” says Leopold. The artwork covers a staggering 71 years of popular culture in America, from an autographed drawing of vaudeville comedian Billy B. Van from 1929 to a gouache painting of Groucho Marx from 2000. The Huntsville Museum of Art brings the best of Hirschfeld to Alabama. Al Hirschfeld Foundation President Louise Hirschfeld and Archivist David Leopold will be giving talk at the museum on Thursday, May 29th, at 7pm. The exhibition runs through September 14th.